Captain Aquilius is a Redguard bandit who only appears during Hard Answers as you leave Calcelmo's Tower after copying the tablet. If Aicantar is still alive, he will instruct Aquilius to search the building. He wears steel armor if you are below level 18, and steel plate armor if you are above. He carries a banded iron shield if you are below level 6 and a steel shield if you are above. 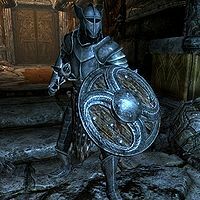 In addition, he wields a leveled one-handed weapon and carries an iron dagger, the key to Calcelmo's Laboratory, the key to the Dwemer Museum, and leveled amount of gold. This page was last modified on 18 January 2016, at 04:54.